Summary: Rhodey is no fool, but every time Tony claims it's an 'emergency' and 'needs help immediately' he believes him. Like a fool. Helping Peter with his holiday job definitely doesn't qualify as an emergency, but at least no one else will see him dressed like this... right? Summary: In order for the Avengers to use the Stones to reverse the Snap, they each must make a terrible choice. "We are the gauntlet," said Tony, looking at Clint, then at Thor and Natasha and Bruce, and finally, Steve. "What is it you keep harping on about? We do this together. We are the gauntlet. There are six stones, and six of us. We each take a Stone." Come enjoy MCU space gen! mcu_cosmic is for talking about and promoting the cosmic side of the Marvel Cinematic Universe, ie all the parts in space, in particular the Guardians of the Galaxy movies, the Thor movies, Captain Marvel, and Infinity War/Endgame. We'd love to have gen fans come promote your fanwork or meta, link to news and articles, and participate in our discussion posts. Our posting rules can be found at our profile. Currently we have an intro post where you can come say hi and find fellow fans, and some polls where you can express your opinion on what you'd like to see at the comm. 16k words | PG-ish| Sam Wilson, Team Cap, T'Challa, etc. A tale in which Sam suspects he should be used to this by now, for values of ‘this’ that involve certain folks he hangs out with and situations he finds himself in, Team Cap becomes Team Ex-Cap becomes TBD, and nobody but Clint really wants to know what happened to Scott Lang’s GI Joes. completed a few weeks ago for Marvel Bang 2015. This story takes place one year after Clint makes the unexpected choice to bring Natasha Romanov in from the cold. They've become co-workers and acquaintances, but Natasha is still as much a mystery to Clint as she was on the day he was first sent to target her. A story about making friends and making choices, set against the backdrop of daily life at SHIELD. It's less strange bedfellows and more complementary parts: Bucky Barnes and Peggy Carter have more in common than Steve Rogers: they have a war to win. And a war to survive. The requirements and qualifications for becoming a USAF Pararescueman. Or, why Sam wasn't kidding when he said he does everything Steve does, just slower. 3300 words | PG-ish | Tony Stark, Bucky Barnes, Steve Rogers, Pepper Potts, etc. "Are you ready to follow Captain America into the jaws of death?" means something else in the Twenty-First Century. Bucky Barnes has the same answer. Sam Wilson, former Avenger and current fugitive, appreciates that on many levels, including the ones he's sure he's missing. A possibly unnecessary epilogue-ish bit for Preserved, aka the Steve Is the 1950s Winter Soldier store, which probably does need to be read first for context. Summary: After the fall of SHIELD, Phil Coulson opens a Leverage franchise. 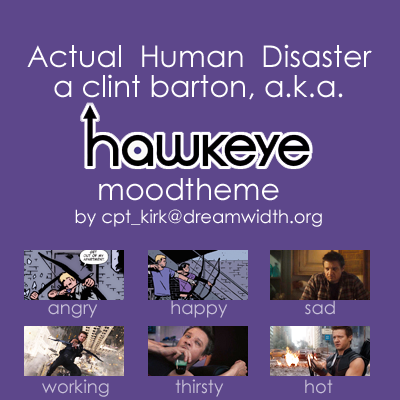 Note: The story is tagged with background Phil Coulson/Clint Barton, but the pairing is not the focus of the story. Summary: Bucky Barnes is used to strange happenings; his time with the Howling Commandos has guaranteed that. He's therefore not totally thrown off balance when he wakes up in an extraordinary tower in a seemingly impossible year. He can’t help but be worried though, no matter how much reassurance he's getting from Steve and his new team. Lovely long gen fic with an excellent, twisty plot. I overlooked this when it came out last year, and even though I'm not generally reading CA fic these days, it sucked me right back in! Highly recommended for all your plotty gen needs. "You want to take care of your people. And you want to fly." Or, how Sam Wilson was too important to be in Avengers: Age of Ultron. The five stages of grief are meaningless in the moment. By the time she had heard of the warning "before you go on a journey of revenge, dig two graves," Wanda had already dug more than that. It was cold comfort to know that even if she'd known of it beforehand, she would have done everything the same. Her rage had been a cold fire, burning everything it touched, and what she had been willing to do in its name, what she had done in its name... She had paid an appalling, unbearable price for her arrogance, but she wasn't sure if she could ever erase the debt of the rest. Pietro, half of her soul and all of her light, was buried on a beautiful morning in the same cemetery as their parents with the other victims of Sokovia's endless wars. Wanda wasn't so sure about that, but Steve told her that she could not take the blame for his death. "A very wise woman once told me that if I truly loved someone, I had to respect their agency and their choices," he said as they stood on a hill overlooking the cemetery. They'd walked up here by accident and by intent, her aimless direction and his determination to stay by her side. "Even if those choices had led them to following me where they didn't have to go and dying because of it. Or worse." Natasha chooses her side in the Civil War as pragmatically as ever, with her eyes on the long game. Clint has no such luxury because the stakes are too high for there to be any choice at all. "Steve's plan is to appeal to our better natures," Natasha explained. The Black Widow explained. "He still sees people as fundamentally good and considerate and willing to do what they can for the betterment of the many. He still thinks there's a community and not a collection of people with their own wifi connections and that people will choose their neighbors over their own fears. He thinks that reason will win out, that liberty will triumph over security, and that the Accords won't be approved. "Tony knows better. He knows that the Accords will pass because people are terrified. They see aliens pouring down from the sky in New York and London. They see robots laying waste to Seoul and Sokovia. They see the Hulk destroying Harlem and Johannesburg. They see costumed freaks big and small tearing up the streets all over the world and they're not sure if it's a bad guy or a good guy because the body count's the same. They feel helpless because they are helpless. And if someone tells them that the Accords will give them some measure of protection, then they are going to grab on to it like a life preserver because drowning people act out of panic. "Tony's not doing press to counter Steve. He's doing press to get in with Ellis and the people who are going to be enforcing the Accords because he knows we can't stop the Accords from without. But we can mitigate the damage from within. If he can grab the wheel, then there's a chance we don't drive off the road before we can stop the car." Summary: What do you do when the Winter Soldier breaks down your front door one Saturday morning? If your name is Carter, you do your job like a professional. Sharon looked away from the surveillance footage: Steve Rogers drifting through a cabin in an undisclosed location, that morning’s timestamp floating in the corner of the screen. In her peripheral vision, Hill studied a duplicate of the folder Sharon held. “I’m not cute like that, sir,” she said, and she felt the room settle, satisfied. Folklore of the Red Room. "Don't cry," they are told when they're first brought to the dormitories, "the Soldat watches over you." Stolen from home with brutal efficiency, too young to understand what awaits them, they take it for comfort. It's only after they've had their first lessons in what the Red Room requires that they know it for a threat. Yet those who survive long enough to train under the Soldat find while he's an exacting teacher, he's not a cruel one. He doesn't torment; kills only when necessary. His codename becomes comfort again when nothing else is. "Don't cry," they whisper to each other in the dark, though none of them cry anymore except as an interrogation method. The words are a ritual, a spell against the possibility that tomorrow they may be ordered to murder each other. "Don't cry, the Soldat watches over you." It's been a decade since she scattered the Red Room's ashes on a biting wind, but Natasha tastes them now as the Soldat sweats and shakes beside her in a motel bed outside of Williamsburg. He murmurs something, his voice catching, and she presses a cool cloth to his forehead. "Don't cry," she says. "I'm watching over you." A life in hindsight: Wanda and Pietro, growing up on the run. A lovely little look at the Maximoffs. Four days in the hospital is more than enough, as far as Pepper is concerned. Her vital signs are stable. Her blood work is as normal as it’s going to get. She's going to have to learn to live with the effects of Extremis eventually. In the meantime, Stark Industries is beginning to implode from the rumors circulating about her condition. Pepper needs to go back to work. 8300 words | PG-ish | Clint Barton, Natasha Romanova, et al. summary: The cost of keeping faith and keeping promises. If they deserved it, then fine. Hill had been right – he’d sleep fine if these were two assholes with only evil in their hearts. But he didn’t want to terminate two kids – and they were kids – because some junior agent hadn’t worked hard enough to sway two idealistic idiots off of the path toward destruction. It was the hardest part of what he did, taking a kill order on faith. It happened more with SHIELD than it had back in the Army, where most of the time he or his unit had been a target of his target before he’d gotten to turn the tables. But SHIELD had a different mission and a different method and the first time Clint saw most of his targets was through the scope of his rifle when it was time to take the shot. Coulson had always given him details, more than needed to do the job, because he’d understood what he was asking Clint to do and what kind of cost it came with. His handlers since had tended to be younger, hadn’t come from either the armed services or SHIELD’s field division, and Clint had occasionally felt like they thought that they were playing a video game for all that they understood about the price of taking a life. And that in turn had made him feel like the weapon instead of the one wielding it, which made it easier to pull the trigger, but harder to keep the faith in the mission and with himself. The Hawkeye who ran on full automatic wasn’t someone he especially wanted to be around. snickfic - Come enjoy MCU space gen!